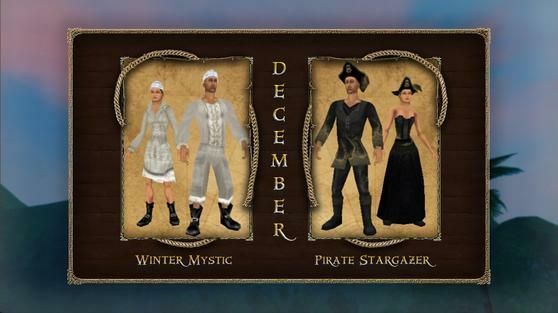 Pirates Online | Wonderful Winter Wares! Ahoy, all ye scurvy pirates an ne'er do-wells! The festive season be quickly approachin' and me an' my fellow peddlers have some fine clothes perfect for plunderin' the high seas AND crashing the Governor's Holiday Ball! Firstly, we have the Pirate Stargazer. Ye'll be lookin' very proper and elegant in this black and gold outfit. Features a fancy vest for the gents and a lovely long skirt for the ladies, both have a matchin' plumed hat that looks very grand for any pirate. Secondly, we have the Winter Mystic. This set is as white as the cold northern snows from head to toe...I don't know any pirate in their right mind that would wear all white, but what do I care as long as it sells? Rumor has it the set is lucky, but that's just a rumor savvy? I won't stop ye if ye want to buy it and try it out anyway but no refunds! An' if that ain't enough for ye, you greedy scoundrels, sometime this month we'll be gettin' in the ever popular Winter Festival outfit, which looks quite jolly with all that red fabric and white trim. The ship be coming from very far north and I don't know when she'll be making port yet. So there ye have it ladies and gentlemen! If ye want to check out these wares, be sure to either visit myself before the end of the month on Tortuga, Bargain Billy on Port Royal, Peddler Phillip on Padres Del Fuego, or Kat Repperson in Las Pulgas...oh! And I be forgetin' Monger Morton on Cuba. Until next month, fair winds and happy holidays to ye all!